“I hope they don’t view me as ‘that billionaire from Canada’,” says Canadian billionaire Lino Saputo Jr.
Saputo, CEO of the giant cheese, milk and yogurt company that shares his name, is sitting in the private locker room he installed in the personal hockey arena he built next to the luxury auto club he owns in Montreal. It’s literally and figuratively as far away from the world of Australian dairy farming as you can get. Nevertheless, the “they” he’s referring to are farmers Down Under. Saputo has been spending a lot of time in Australia lately. Last year, his company acquired the country’s largest dairy processor, a farmer-owned co-op called Murray Goulburn. To seal the deal, Saputo spent weeks criss-crossing thousands of kilometres of arid grasslands, making his pitch to farmers at town hall meetings. In some cases, he even drove directly to farms to sit at their kitchen tables and field questions one-on-one. Which prompted my first question: What must those farmers think when Quebec's richest man—his family's stake in the company is worth $7 billion—shows up on their doorstep? Were this folksy sentiment to come from any other 0.0001-percenter, it would be about as easy to swallow as sour milk. But Lino Saputo Jr. is a man of contradictions, able to move back and forth between diverse worlds with remarkable ease. In one moment, the impossibly young-looking 52-year-old might be decked out in a shimmering suit and Bono-style glasses for the ritzy launch of a new Rolls Royce model; the next, he’s on the ice in his goalie gear, blocking shots from blue-collar plant workers. He has a fascination with 1980s-era Porsches and maintains a constantly revolving collection of around 40 luxury cars that he stores at his Automobiles Etcetera private auto club (“I buy and sell them—I love the hunt”). Yet his go-to family restaurant is Bar B Barn, a Montreal chicken-and-rib institution that boasts cartoon-animal mascots and where the rib options range from Baby Hawg to Whole Hawg. “Lino is someone who can speak to royalty and then go talk to the janitor,” says McGill University management professor Karl Moore, who regularly invites Saputo to speak to his students. Increasingly, the polarized worlds Saputo must navigate exist within the dairy industry itself. When Saputo thrust himself into the NAFTA trade fight last summer, breaking ranks with Canada’s powerful dairy lobby to side with American farmers, it was revealing: Saputo Inc. may be a creature of Canada’s dairy cartel, having benefited early on from the protectionism it entails, but its CEO is an insider more than willing to stand on the outside. Saputo’s disarming manner and blunt honesty have much to do with how the company got to where it is today. While Saputo Inc. has little name recognition outside of Quebec (the company spends very little on marketing), it has quietly grown into one of Canada’s top international success stories. With 62 plants on five continents—in February, the company announced its latest acquisition, the $1.7-billion purchase of U.K.-based cheese and butter maker Dairy Crest—it is among the largest dairy processors in the world, with 15,000 employees. And with expected sales of more than $13 billion this year, 70% of which comes from outside Canada, Saputo Inc. has become a stock market darling. Since Saputo Jr. took over from his father and namesake Emanuele (known as Lino Sr.) in 2004, the company’s shares have soared 680% (including dividend reinvestment), handily topping the S&P/TSX Composite Index’s 173% total return. But things are far from idyllic in the land of milk and money. The global dairy market is drowning in a glut of milk, while more consumers bypass the dairy aisle. At the same time, a world that seemed to be growing smaller thanks to globalization is now seeing countries turn inward, leading to geopolitical strife and the threat of trade wars. It's all starting to weigh on Saputo's financial results and stock; over the past three years, Saputo's share price has suffered the indignity of merely matching the benchmark index. Saputo Jr. isn’t sitting still. The recent deal that plunged the company into the U.K. market just a month before Britain’s scheduled exit from the European Union was characteristic of a company built on bold bets. But this is also an important moment. As the third Saputo to run the company after his father and grandfather, he is ever-cognizant of the curse of the third generation. “Rags to riches to rags,” Saputo chimes in, referring to the old adage that the first generation starts a business, the second builds it up, and the third blows it to pieces—a pattern that played out famously with Quebec’s Bronfman clan and its Seagram fortune. Never have more eyes been on Lino Saputo Jr. than right now. The first rule of dairy club is you do not talk about dairy club. For close to 50 years, Canada's supply-managed dairy industry, which shields farmers from international competition through a mix of quotas, tariffs and price controls, has defied every effort at reform. All but the maddest of politicians (see: Maxime Bernier) have been cowed by the deep-pocketed, lobbyist-infested, vote-mobilizing power of Big Milk. The election of Donald Trump changed everything. Trump quickly drew a large bullseye on Canadian dairy, repeatedly flaying the country for “what they've done to our dairy farm workers. A disgrace, it's a disgrace.” Tensions reached a fevered pitch by June 2018, when Trump attacked Justin Trudeau as “meek and mild…dishonest and weak” after the Prime Minister swore to defend Canadian dairy farmers. Saputo watched it all unfold and shook his head. He knew the Americans weren't looking to dismantle Canada's entire supply-management system. Instead, the sore point was a relatively new pricing rule around ultrafiltered milk, a protein-rich ingredient increasingly used to make cheese and yogurt. American dairy farmers had enjoyed a mini-boom in recent years by exporting the stuff to Canada, since it wasn't covered by Canada's existing quota system, and the Canadian Border Services Agency didn't even consider the protein concentrates to be milk. Then regulators gifted Canadian farmers with a new pricing category (known as Class 7) that shut out the Americans while opening the door for Canadian farmers to sell their own ultrafiltered milk competitively on world markets. For a company like Saputo that wants to continue to grow, that means we have to think about markets outside of Canada. Except it didn't. And how could it? Saputo Inc. isn't the same company it was when Canada succeeded in excluding supply management from the 1988 Canada-U.S. trade deal and, later, NAFTA. In just the past year and a half, Saputo has spent $3.6 billion on six acquisitions. One of those was in Canada (a small, Ontario-based maker of specialty cheeses and Icelandic-style yogurt), but the others were in Australia, the U.K. and the U.S. It also operates two plants in Argentina, thanks to its 2003 purchase of that country's third-largest dairy processor. According to Dutch agribusiness firm Rabobank, which tracks the world's largest dairy processors, Saputo ranks eighth in the world—and that was before the company's most recent deal in the U.K.
That's because the artificially high milk prices paid to Canadian farmers (and then passed on to Canadian consumers) mean products made from that milk will never be competitive for export to the rest of the world. That was a driving force behind the surprise announcement in 1997 that Saputo (sales: $450 million) would swallow U.S. cheesemaker Stella (sales: $800 million). The deal cemented Saputo’s reputation as one of the most efficient operators in the food industry. Dino Dello Sbarba, the company’s former president and chief operating officer, now retired, recalls touring a Stella plant with Mr. Saputo (which is how he refers to the elder Saputo) and Lino Jr. at the time. “We saw how disorganized it was, and it was obvious to us we could turn Stella around and make a lot of money,” Dello Sbarba says. “We didn’t see the complexity of their systems or their sales, or how they were managing their marketing. We just saw they didn’t know what they were doing from an operating standpoint, and we did.” Almost immediately after taking over, he says Saputo slashed the amount of cheese Stella produced by 15%, yet was able to boost earnings before interest, taxes, depreciation and amortization by 50%. It was a model for the frenzied deal-making to come. Since buying Stella, Saputo has spent in excess of $7 billion on more than 30 acquisitions, from tuck-in businesses that complemented its existing operations to transformational transactions that took the company into new countries and markets. It’s worth pausing for a moment to reflect on that number: 30. As a rule of thumb, business consultants will tell you that anywhere from 40% to 60% of M&A transactions are considered failures because they don’t deliver the promised results. Companies overpay, cultures clash, egos get in the way. Which makes Saputo Inc.'s Pac-Manlike pace of acquisitions all the more remarkable. Aside from two small European plants the company bought in the mid-2000s and ultimately closed—because they didn’t have the critical mass needed to compete profitably—the company has never botched an acquisition. “They’re very disciplined from a financial perspective, but I’d say even more importantly from an operational perspective, they really take the time to make sure that the cultures are aligned, or they have a clear path to making that happen,” says Mark Petrie, an analyst with CIBC World Markets who has covered the company for the last decade and currently has a “neutral” rating on the stock. A couple of days after Colizza joined the company in 1998, Lino Saputo noticed a new face among his 3,000 employees and stopped to chat with him. The pair discovered a shared love of hockey—a passion that has played a key role in helping transfer the Saputo culture to its far-flung plants. To call Saputo a hockey nut would be an understatement (les Canadiens, bien sûr). In addition to playing in net, he’s also part owner of Quartexx Management, a player agency that represents Patrice Bergeron, Kris Letang and Bryan Little. A few years ago, while playing hockey with one of his sons at a crowded Montreal rink, Saputo struck on the idea of building his own arena. Saputo calls himself a “closet architect,” so he drew up a design, complete with executive boardroom and high performance gym. The three-on-three rink gets rented out for $300 an hour, but it also plays home to an annual company-wide tournament involving hundreds of Saputo employees from across North America. Saputo himself also helped create a draft so teams would have a mix of players from across the company. “People end up going back to their plants, and they become ambassadors of our culture,” says Colizza. The Saputo empire owes a lot to that most exotic of dishes, pizza. In the mid-1950s, the Italian staple was just starting to catch on in Canada (the first pizza ovens weren’t imported until 1957), and early stories about this miraculous new food included instructions on how to pronounce the word. Giuseppe Saputo and his eldest son, Frank, arrived on Canadian shores from Sicily shortly before pizza did, in 1950. Two years later, the rest of their family, including Emanuele (a.k.a. Lino Sr.), joined them in Montreal. Back in Italy, Giuseppe had been a cheesemaker, but in Canada he took a job as a labourer. Emanuele convinced him to return to the cheese business, and with a $500 investment and a bicycle to make mozzarella deliveries, the business was soon expanding alongside the pizza boom. As a child, Saputo Jr. knew he wanted to join his father in the company. At 10, he was sweeping floors and hand-wrapping cheese, and by 13 he began helping with deliveries. Lunches involved scooping ricotta out of vats and putting it on baguettes. To this day, that workhorse staple of Italian kitchens remains Saputo’s favourite cheese—he eats it every day—even though his company’s Le Cendrillon goat cheese by Alexis de Portneuf won best cheese in the world in 2009. 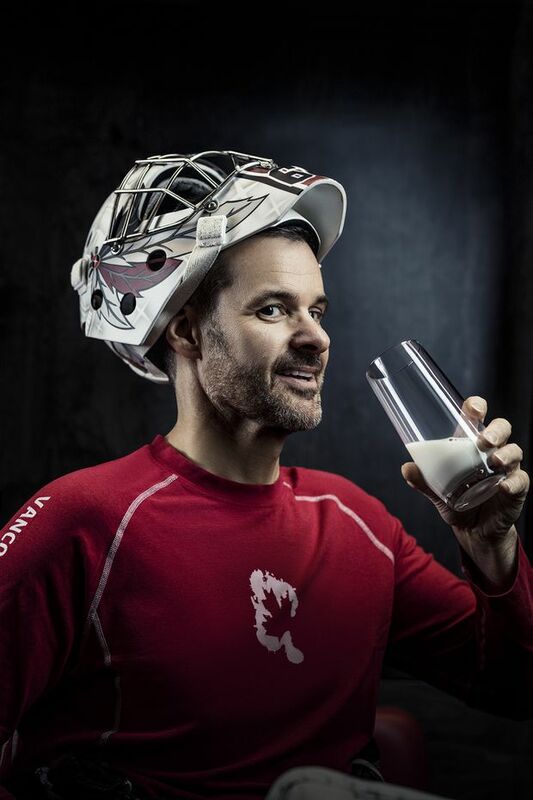 Throughout Saputo’s teens, he learned in detail the process for turning milk into cheese and continued working his way through the company during summers while completing university. He’d originally planned to attend St. Francis Xavier University in Nova Scotia, but he met and fell in love with his future wife, Amelia, and ended up staying in Montreal, where he earned a political science degree from Concordia. The couple married when they were in their mid-20s, and within five years they had two sons, Emanuele (Manny) and Giordano. By his early 30s, Saputo had moved from managing plants to overseeing the company’s rapidly expanding manufacturing operations. For all Saputo's growth, however, Lino Sr. saw trouble ahead if it remained a family-owned business. Lino Saputo Jr. isn’t exactly a household name outside Quebec, but the scion oversees a global dairy empire. Early in 2018, bushfires raged across Australia’s Victoria state. Caught in the middle of some of the blazes were several dairy farms that supplied Warrnambool Cheese and Butter (WCB). Four years earlier, Saputo had emerged from a bidding war for WCB, beating out Murray Goulburn Co-op, and Lino Saputo Jr. was in Australia for meetings at the WCB plant. Wanting to help, but not wanting to intrude, Saputo had his staff reach out, and once he got the all-clear, he visited five of the farms. Some were burned to the ground, and other farmers were rallying to help. “There was this great chemistry and camaraderie among the dairy farmers, which I loved to see,” he says. One farmer who'd been hit told Saputo all his fencing had burned so he couldn't contain his cows. Saputo had his people bring new fencing over that afternoon. Saputo could easily have used the visits to his advantage. At the time, the company was in the process of buying Murray Goulburn (MG), the co-op he'd beat out for WCB in 2014. MG had made some terrible decisions that left it deep in debt and losing suppliers. After attending dozens of town halls with the co-op's farmer-shareholders, Saputo clinched the deal last spring. He needed one vote more than 50% to win; he got 98.1%. Saputo and his father had been stalking Australia for 12 years before making their first deal there. The allure was clear: its proximity to Asia, where dairy consumption is low but growing fast. China, for instance, consumes just 36 kilograms per person of fluid milk, one-third the annual world average and just one-10th the level consumed by people in developed countries. Here at home, Saputo the company faces its own set of challenges. While Canada agreed to scrap Class 7, the pricing system for ultrafiltered milk Saputo came out against, negotiators also dealt away greater access to the Canadian dairy market under the new trade agreement than Saputo expected. All told, he says, between the replacement trade deal with the United States and Mexico (USMCA), the trade deal with Europe (CETA), and the Comprehensive and Progressive Agreement for Trans-Pacific Partnership (CPTPP), roughly 12% of Canada's dairy market is now open to foreign imports. Still, tastes are changing in North America as consumers turn away from conventional milk. Even the recently updated Canada Food Guide downplays milk and cheese consumption—staples since the guide's advent in the 1940s. Per-capita fluid milk consumption has shrunk by nearly one-quarter since the end of the 1990s, and the pace of the decline is accelerating. From 2016 to 2017, consumption fell by 4%. Saputo’s answer is to go premium. So-called “value-added” milk products are growing fast—things like the single-serve flavoured milks offered by Saputo’s Milk2Go label. Another area where Saputo sees growth is in high-protein, low-lactose milk, such as its Joyya brand, an ultrafiltered milk that it launched last fall. However, the company is going up against Coca-Cola’s Fairlife brand, also a high-protein, low-lactose milk that’s available across the country. Coke is in the process of building an $85-million plant in Peterborough, Ontario. In the meantime, the beverage giant received a temporary licence from Ottawa to import all of its milk from the U.S.
Saputo certainly has the room to make more deals. For months before buying Dairy Crest, Saputo had been saying the company had roughly $3 billion it could spend on acquisitions without having to tap equity markets, and that it had five or so potential takeovers in the pipeline. That means it still has more than $1 billion to spend, so expect the deals to keep coming. The only question, then, is how big this big cheese could get. Smooth and rustic: La Sauvagine is a cow milk cheese with a moist and supple rind that ripens from the outside in; runny ivory body; fresh butter taste with a hint of mushrooms; melts in the mouth and is flavourful; culminating with a rustic taste. Rich and robust: Crowned Best Cheese in the World at the 2009 World Cheese Awards. Vegetable-ash-covered cheese with a marble-textured rind and a smooth ivory body; acidulous, semi-strong taste that becomes more pronounced with age. Supple and nutty: Cantonnier is a semi-soft pressed cheese, uncooked and surface ripened with a washed rind. It distinguishes itself with its effervescent flavour, reminiscent of fruity cream and fresh apples. Rich and pronounced: A smooth version of the blue cheeses; frank and delicate; creamy, not too salty; a product of the marriage between brie and blue cheeses. Buttery and delicate: When young, this cheese has a creamy texture like that of whipped cream, with a fresh cream flavour and a slighty acidic aftertaste. The whipped texture becomes smooth and spreadable when it reaches its peak, thus bringing out the pronounced butter flavour. It melts in your mouth.